Because no one reads the newspaper, and SportsCenter's anchors are too perky for this early in the morning, Deadspin combs the best of the broadsheets and internets to bring you everything you need to know to start your day. 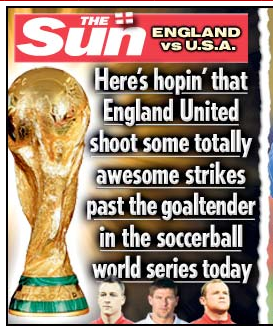 • Apparently, the editors of UK Sun still thinks our country is populated with Valley Girls and stoners. They would not be wrong about that. And Wayne Rooney says England fears no one. Not even baby-mauling foxes? Everyone's afraid of those things. Totally, dude. • Jamie Moyer gave up 74 runs in one inning of work as the Boston Red Sox beat the Phillies 456-2. Good morning. It's Saturday. It's going to be short one today, so we can be with our countrymen and watch the game. Oh you didn't know I was Nigerian?